Humphrey's Restaurant and Bar's proximity to SLU makes it a go-to spot for college students. The spacious restaurant serves up classic bar food. Appetizers include fried mushrooms, jalapeño poppers and toasted ravioli. 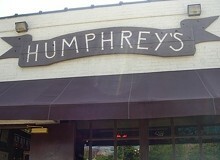 Humphrey's also offers bigger bites, including hot dogs, salads, a pork fritter and burgers (veggie burgers are available). For early birds, the restaurant has breakfast items such as an egg sandwich, biscuits and gravy, and a slinger, while night owls can sit back with a few cold ones until the wee hours: Humphrey's stays open until 3 a.m.